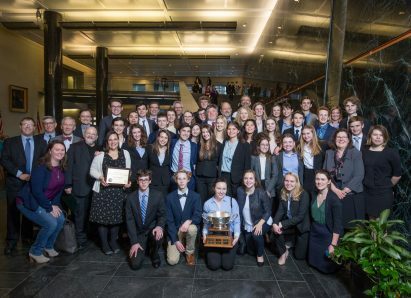 On Saturday, January 13, 2018, six teams participated in the We The People: The Citizen and the Constitution state high school competition at the Mark O. Hatfield U.S. Courthouse in downtown Portland. Supported by teachers, coaches, parents, and civic leaders, over 150 students demonstrated their deep understanding of the workings of our Constitution. Teams from Central Catholic High School, Cleveland High School, Franklin High School, Grant High School, Lake Oswego High School, and Lincoln High School participated in Saturday’s competition. This year’s teams were spared the chilling weather that delayed last year’s competition but proved just as eager to prove their skill and knowledge. The Grant team will go on to compete at the National Competition in April. Congratulations to all the teams for their impressive displays of knowledge and engagement!